Pai Gow poker is a casino game of Chinese origin. Many poker players in South Africa are still discovering this game and loving it. This is because the game it is a little slower than fast paced casino games like blackjack. However, it is faster than traditional forms of poker. That is why in some circles people call it the “blackjack of poker”. Sam Torosian of the Bell Card Club is credited with the development of the modern version of Pai Gow poker. Having been adapted from Chinese dominoes to card play, the game offers some real online casino entertainment. Pai Gow is played with a 53 card deck where the joker is the extra card. The game is very simple to understand and play. Even though the game was created in the 1980’s it quickly became popular in Vegas and eventually moved to other regions of the world. The game has progressed and there are now many variants of the game available to play. The popular variants include Pai Gow Mania which allows side bets and progressive Pai Gow poker which has a side bet on the progressive jackpot. The online casino game is commonly known as double handed poker. This is because players are required to make two hands instead of one. Up to 7 players can play this game at the same time. And a minimum number of players is two allowed. Where at least one of the players is the Banker. To win this game, players are required to get two hands that are higher than the dealer’s hands. 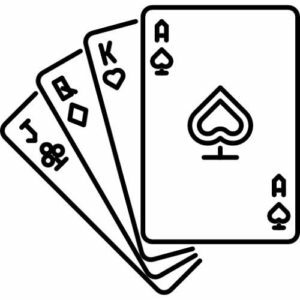 From the seven cards that are given to the player, the player has to make a 5 card hand and a 2 card hand. The 5 card hand is referred to as the high hand while the 2 card hand is the low card. This means that players will have to make sure the 5 card hand is of higher value than the two card hand. Failure to rank hands correctly will result in the hands being rearranged according to house rules or the hand being forfeit. When the player’s hand ties, the Banker takes a certain percentage of the bet. This gives the Banker an advantage in the game. Learn about Pai Gow poker rules.